The big picture remains the same. Progression. Improvement. Call it what you will. Kildare are back in Division One from whence they dropped like a stone under Jason Ryan. Most won’t argue with that. Accentuate the positives. Five wins out of six games when the promotion chips were down and the one aberration a last minute implosion in Derry. All good then? For a normal county: yes. Absolutely. Today was a meaningless exhibition match played out in front of a handful of die-hards at headquarters. The pigeons weren’t even interested. Two counties who hate the place at this stage. Galway famously without a win here since 2001. Kildare nervous wrecks as soon as they venture beyond Rathcoole. Meaningless though? Nope. Afraid Not. Add in a winless streak against the Tribesmen going back to 1985 and for so many on the team the chance to avenge their most horrendous melt-down at under age level, kicking 19 wides and losing to today’s opponents in that under-21 semi final four years ago. Important? Surely. But not enough it seems. From the start Kildare were lacklustre, pedestrian, spiritless. Galway had all the energy. If the reserve team could put it up to them in Salthill last week in a dead rubber, surely the chance of a national title on the big stage would bring out the fight in the first choice XV? Afraid not. It was 55 seconds before a Kildare player laid a hand on the ball as Galway gave most of their attacking players a taste of it in Kildare’s half. Mark Donnellan was grateful to see Eamonn Brannigan’s weak effort drop into his hands to end that sequence but after Chris Healy struck a wide with their first attack, Galway moved freely through the Kildare defence with the excellent Paul Conroy finishing the move with a point. That set the pattern for an awful first half. Galway dominated possession against an immobile Kildare midfield and looked dangerous running at their defence but kicked some criminal wides as the half wore on. Kildare on the other hand never found any sustained rhythm but were slightly more economical when they did find themselves in front of the posts. Kildare were sloppy though. A rushed pass from Johnny Byrne wasn’t properly controlled by the out-of-sorts Kevin Feely in the Galway half and the subsequent break led by Brannigan ended with the same player taking Sean Armstrong’s pass to edge Galway two ahead on 8 minutes. You felt Galway could make real gains if they just went for the jugular. David Hyland decided to inject some impetus into Kildare’s attacking and drew a foul from which Feely opened their account on 11 minutes from 47 metres. Shortly afterwards, Galway seemed to be going nowhere slowly when Feely fouled Armstrong and Gary Sice found the range with a free to make it 0-3 to 0-1. Healy, surprisingly deployed too far from goal, made a smart incision to bring Niall Kelly into the game and the Athy man made no mistake with his first point on 15 minutes. Kelly’s class shone all afternoon on a day when he would go on to tally up five points from play. Unfortunately no one matched his standards in a white jersey but he can hold his head high. Fergal Conway fed Kelly a minute later and he made no mistake again to bring the sides level at 0-3 each. Ben McCormack, quiet up until then, injected some pace into a left-wing attack and Cathal Sweeney’s seemingly perfect tackle was deemed to be a foul to set up the lead score – Feely from close range on 19 minutes. Playing their worst football of the season Kildare were somehow in front. They wouldn’t score again for 11 minutes. Galway were scarcely better though. Brannigan hit an upright when he should really have scored, and Liam Silke blazed wide from 13 metres just as Michael Meehan’s face appeared on the big screen. Galway’s shooting malaise continued with Johnny Heaney shooting another wide before Armstrong opened his account after leaving Paul Cribbin for dead on 25 minutes. The first goal chance of the game took 29 minutes to arrive. Galway’s wing backs combined with Gary O’Donnell lobbing a ball over Eoin Doyle to put Heaney in on goal. His rather weak effort was well saved by Mark Donnellan though and Doyle was on hand to clear. Hyland lost patience with his attack once more and was involved three times in the move that led to his excellent lead point on 30 minutes. The full back was the only Kildare player attempting to break tackles at pace in that first half. The wing backs were becoming more prominent for the Tribesmen though and O’Donnell sauntered down the right wing, played a one-two with Armstrong and under little pressure brought Galway level at 0-5 each. Donnellan was on target from a ’45 before the pacey Shane Walsh got himself on the scoresheet to leave them level at half-time. If Kildare got a rocket from O’Neill at half-time it didn’t show. Walsh showed his class once more straight from the throw in with a fine point and Armstrong pointed almost immediately to push them two ahead. Intent signalled. Brannigan could have put daylight between them two minutes into the half when he did raced through the lacklustre defence from midfield but failed to connect properly under pressure from Keith Cribbin and Tommy Moolick with Donnellan’s goal at his mercy. Galway looked like running away with it in those early stages though. The frustrating Brannigan swung a poor shot wide, however. Kildare had to replace Paul Cribbin on 39 minutes. The star attacker had failed to make any impression although he was clearly injured by the time he departed. Club mate Cathal McNally replaced him. Fionn Dowling opened Kildare’s second half account after a forward burst from Ollie Lyons but with the scoring pace increasing Sice fed Heaney overlapping on the right to make it 0-9 to 0-7. Another injury saw McCormack depart the scene with David Slattery replacing him. A foul on the Confey man gave Feely the chance of another point from a free. Kildare were playing better now and McNally took a pass from Kelly to fire them level. 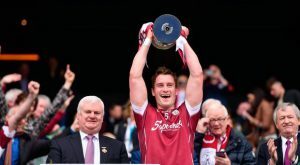 Immediately afterwards Moolick soared high in midfield, found Slattery and Keith Cribbin took a leaf out of the Galway wing-backs’ books to fist over for the lead point. Another Slattery burst set up Kelly to finish excellently with his left peg and Kildare were two ahead. They never looked comfortable though and unforced errors were confidence-sapping. Walsh failed to punish a poor Moolick pass in midfield but when Cribbin kicked away possession immediately afterwards the resultant attack saw the centre-forward blasting over his third point. Slattery though was having a big influence and he set up another excellent Kelly effort on 51 minutes, Hawkeye confirming its legitimacy. 0-12 to 0-10. Kildare still weren’t at the pitch of it though and they immediately allowed an unchallenged Heaney to bring Galway back to a one point gap. Conway had failed to reach his normal level in the first half but the Celbridge man raised his game after the break and he edged Kildare two ahead again after a fine solo effort on the right. For the third time Slattery set up the on-rushing Kelly for a point and at 0-14 to 0-11 Kildare had engineered a winning position with 17 minutes remaining. They were winning midfield possession and suddenly finding room to manoeuvre up front. And with Kelly on hand to finish off the good work of his colleagues a morale-boosting win looked on the cards. But this is Kildare and this is Croke Park. Into their shell they fell. They would go 12 crucial minutes without scoring. Thomas Flynn sent O’Donnell through again and he fisted Galway back to within two. Conroy then beat an anaemic tackle from Byrne to make it a one point game. Galway looked to their bench and found plenty of options. Gareth Bradshaw came on and set up Heaney for another goal chance. Donnellan saved again but Feely had pulled the Galwayman back and Armstrong levelled proceedings from the free. Kildare didn’t create a goal chance all day. The nearest they came was when Slattery burst through again but shot wildly wide from 20 metres. A point might have been the better option. Michael Daly (son of Val) entered the fray for the mis-firing Brannigan and shrugged Mick O’Grady aside with his first possession to put Galway ahead with 10 minutes remaining. 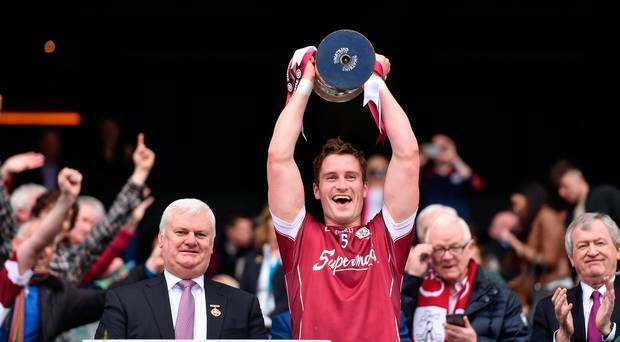 Four in a row for Galway with the game in the melting pot. Kildare’s looseness was evident again when Silke was allowed to fire over unchallenged from 40 metres. Criminally poor defending from the Lilies. Galway were winning most of the 50/50’s now although O’Grady superby robbed another Galway sub Damien Comer. Kildare were clinging on and Feely scored his only point from play to make it 0-16 to 0-15 with 5 minutes left. Bradshaw though put two between them again with a fine score from just inside the “D”. Into four minutes of injury time and Feely found Moolick with a short free, the Leixlip man pointing to bring the gap down to one with two minutes remaining. Again Kildare allowed Galway to attack with hardly a hand laid on them though and Daly kicked the final score of the game from long range. One last chance for the Lilies and the excellent Slattery bore down on goal but was pulled down just outside the box. Needing a goal Feely tried to summon up the spirit of Rob Kelly and while his effort cannoned off the upright it was too high anyway to trouble the Galway net. Game over. A curious game. If there was a game next week you’d say the team would put this behind them and move on quickly. But with two months to wait until the opening championship game and another opportunity to lay the Galway and Croke Park ghosts spurned, you wonder what damage this might do to the fragile psyche of the Kildare footballer. We can accentuate the positive from the spring campaign, but it would have been a whole lot easier to be convinced they’ve turned the corner with some silverware on the mantelpiece. Only Hyland, Kelly, Donnellan, Conway in the second-half and substitute Slattery can be any way satisfied with their performance this afternoon. Too many “big” players mis-fired (to be polite) or didn’t show up (to be less so). It’s not the first time of course. Victory for Kildare would have been a travesty of justice. Galway had most of the possession, most of the chances, fashioned the only real goal attempts, played at a faster pace and had the stronger bench to call upon. They’ll have to figure out for themselves how they edged home by only two points. As for Kildare supporters? We’ll keep the faith. We have no choice. But no Kildare team makes it easy. Kildare: Mark Donnellan (0-1, ’45); Mick O’Grady, David Hyland 0-1, Ollie Lyons; Johnny Byrne, Eoin Doyle, Keith Cribbin 0-1; Kevin Feely (0-4, 3f). Tommy Moolick 0-1; Fergal Conway 0-1, Fionn Dowling 0-1, Paul Cribbin; Chris Healy, Niall Kelly 0-5, Ben McCormack. Subs: Cathal McNally (0-1, for P.Cribbin 38), David Slattery (for McCormack 43), Peter Kelly (for K.Cribbin 65), Eamon Callaghan (for Dowling 65).